Our leaders can’t maintain basic discipline and professionalism in their own office – the parliament. However, they do want to have order and discipline with its populace. The hooliganism on the toll plaza is nothing but a reflection of our parliament and of how things get done in this country. Everyone has a perspective and we’d all be dumb if we all think the same way. There can be various arguments for and against the toll tax. However, the manner of protest only reflects what fits in with the Indian way of life. While I believe that the toll-tax is wrong, I do have questions for those who protested at the plaza. Did you question your MLA? Did you ask him what he/she has done to look after your interest? Was he with you with a promise to stand by the people who voted for him? My request to these protestors is to NOT vote anybody again until they find someone who can appropriately represent their case. If it is you who had to go out and become the hooligan, your MLA quite obviously has failed you. It will be a shame if the same guy gets elected the next time round – It would be your failure then. I do not say that at the end of the day you will come out as winners and the toll tax will be removed. It most likely will not happen. But at least you will have a fair hearing. The outcome will be such that you will not feel like going out and behave like hooligans. India is not yet ready for toll taxes. Never mind the so-called liberalization, we are still very much a socialist state. We may have considerably opened up the economy as compared to the past, there still are a vast swath of people who cannot survive without government subsidies. This is thanks to the ineffective control over leakage of money from the government coffers. Becoming a capitalist system makes sense when the entire system works on a “Customer-Centric” model where the citizen becomes the customer. This is not the case in India – yet. Our citizens do not have the power, influence and education to dictate their terms. Large sections of our populate does not wield any influence with the people who make the world go round for the country. An expressway provides a means to commute faster, safer, and in comfort. It is alright if one needs to pay for these luxuries. But it is ok only if a basic system already exists. It is like saying that until now you were travelling from point A to B on a bullock cart for free; now you will travel in a car but needs to pay for it. It does no good for a person who travelled in a bullock cart only because he did not have the money to buy the car. Now that poor chap can’t travel at all! An expressway with toll tax without any other sufficiently adequate (stripped of luxurious space) road makes sense in a country where it is recognized that all commuters have the capacity to pay for the luxury. It does not work if one of the connecting states (Haryana) has 41% of its population living below the darn poverty line (as per 2005). Look at this from the perspective of an individual who used to travel on this route on a daily basis. His salary hasn’t changed much over last 5 years. Price for food has increased by 50%. His taxes have remained the same. The petrol he used to spend on the route has become expensive by at least Rs 10 per liter. How in the world can you justify an addition of a toll tax on his daily expense? The simple question he’d ask is “What the heck happened to the tax I gave you?”. He’d say you can’t just “replace” a free road with a paid one. It is ok if you “add” over it and I might “choose” to pay extra for it. I may have used the term “free” but it is really not free. People have paid tax (supposedly) for it at an earlier time. Now there are two problems. First not everyone pays tax. The only people who end up shelling out the right amount of tax are the salaried individuals. Ironically this happens because in an otherwise broken system, the only control that works is to deduct the salary at source. The so-called small businessmen who oppose the FDI in retail do not pay a dime. Nor does the farmers. Either they are too poor to qualify or they are too aloof to bother. The big businessmen are in cahoots with the guardians of the broken system and get away too. Second problem is that whatever is collected gets swindled away in a system without sound controls. With this two problems into consideration, there is also no visible evidence that government is doing enough to curb corruption and fix the system. There is no dearth of money with the government if it comes out to making efficient and honest use of its resource. There are good things to speak off as well. Metro has done a lot to provide comfort at probably the right prices. Crowds during rush hour on the metro is a sign of both good and bad. It is good as it shows so many people find it worthy of use. It is bad as it shows so much more is needed to be done. The Expressway has negligible public transportation. There should be a whole lot more public buses plying on the route. This would discourage private transportation and would help in many other aspects. Imposing a toll tax without adequately providing public transport is another reason against having it. Replicating socio-economic models of other successful countries is alright if we also replicate the model of corruption-less governance. 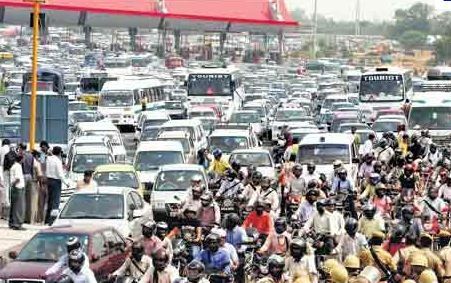 The way the things are currently, the toll tax on Delhi-Gurgaon expressway needs to be free.